Banks of all sizes are seeking the right integrated receivables solution to address the evolution of their clients’ payment habits in a cost-effective manner. Thankfully, nimble fintech companies are offering scalable treasury management solutions that streamline payments. Integrated receivables has become a buzzy term in the financial services industry, and for good reason. By leveraging a suite of tools to integrate client receivables, banks are able to automate payment processing, reduce days sales outstanding (DSO), and improve cash flow. The demand for integrated receivables shows it is more than a trend. Seventy percent of banks surveyed by Aite Group between October and November 2017 ranked integrated receivables as a high priority. In that same survey, Aite Group found that more than 70 percent of businesses reported that it is important or extremely important that a new bank partner offer integrated receivables. There are several industry sectors with businesses that are struggling with processing and managing all paper and electronic payment streams. Banks can solve these challenges, if they leverage the right integrated receivables solution. Some of the most valuable business clients for banks are facing unique challenges managing payment types and channels in a centralized dashboard. These clients are ideal candidates for a true integrated receivables solution. Property management companies are an excellent example. While some of the larger property managers have set up electronic payment portals, and a few tech companies are popping up to offer mobile payment apps, many tenants end up paying their rent or HOA fees to their property manager by paper check, either by mail or hand-delivered to an office. In healthcare, doctors’ offices have different preferences for payments—and so do their patients. Some doctors may prefer to accept cards or paper checks in the office, charging a patient immediately before or after an appointment. Other doctors may not know what co-pay to charge, and later mail a paper invoice requesting a check payment. Municipalities and nonprofits experience similar scenarios, with individuals seeking to make payments in person, over the phone, by mail, or online. What all of these industries have in common is that they serve individuals who change their payment habits over time. What an integrated receivables solution can do is allow these businesses to review, approve, and report on all payments received, regardless of the payment method or channel used, from a centralized location. This makes it easier and more efficient for businesses to offer a wider variety of payment options to their customers. Bank clients struggling with laborious, time consuming, and overall inefficient processes for managing accounts receivable are eager for an integrated receivables solution. Understanding these challenges allows banks to better assess the right integrated receivables solution for their current and future clients. 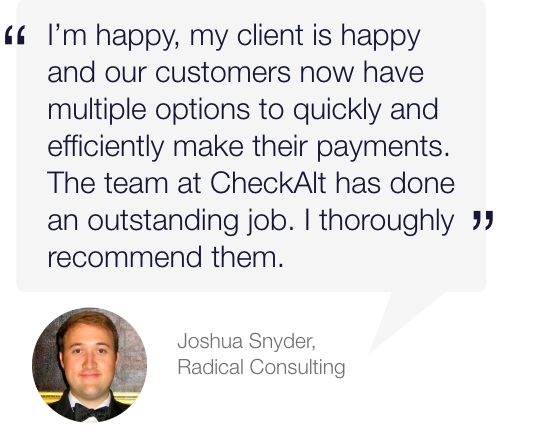 CheckAlt’s true integrated receivables solution gives bank clients the power to capture 100 percent of their client’s receivables business regardless of the payment type or payment channel. All of those payments flow into a single management tool from which clients can control rules for payments. By pulling all payments into a single online management portal, banks and their clients have access to actionable data for better decision making. Our nationwide network of processing sites, paired with our suite of private-label payment solutions, enable faster payments for our bank partner clients. By directing all of these payment types into CheckAlt’s online portal, we can convert the various payment file types into a single consolidated posting file in whichever format bank clients choose. Our paper lockbox solution Remit enables bank partners to get their wholesale, retail, and wholetail clients’ paper payments processed quickly. All of our bank clients can access our hub-and-spoke network of 14 lockbox processing sites to quickly expand their footprint in markets outside of their current service area. All items are batched and scanned into a software system that reads the data on the checks and remittances. That data is stored on secure servers and is accessible through a customized online management portal where clients can use online decisioning to resolve exceptions for same-day deposits delivered at the right time, in the right format, to the right location. Our expedited process separates us from other traditional lockbox services, which typically deposit resolved exceptions the following day. CheckAlt’s remote lockbox solution, RemitStation, allows businesses to scan the paper payments delivered to their offices—both check and remittance—directly into our system. Those payments are instantaneously merged with the rest of the paper payments delivered to any of our 14 processing sites across the U.S. Most businesses, including CheckAlt, are actively working to convert paper payments to electronic. Even when a bank client’s customer thinks they’re making a digital payment, that payment is often converted into a paper check by an aggregator and then mailed to the recipient's bank for deposit. CheckAlt’s Catch!,is our electronic lockbox solution that prevents paper checks from ever being cut by instead routing those payments through those aggregators as ACH transactions. With Catch!, CheckAlt has been able to convert more than 80 percent of paper checks to electronic for our bank partners, decreasing overall processing times and costs. Another way we help banks convert their clients’ payments to electronic is with our electronic bill presentment and payment solution, KliknPay. Our fully integrated web portal allows bank clients to present summary statements to their customers online, and accept multiple payment methods including ACH, debit cards, and credit cards. All payments coming through our Remit, RemitStation, eKlik, and KliknPay solutions are pulled into a single management portal, which has unique controls that address the challenges that banks’ most valuable business clients face. CheckAlt can work with existing bank partners, leveraging the ability to pull third-party data into our system and create a complete picture of all bank clients’ receivables. There’s a huge opportunity for banks to automate significant labor costs affecting businesses. Right now, less than 10 percent of banks' services spending is going toward integrated receivables, according to Aite Group—yet they estimate that there’s an $8 billion-plus opportunity for banks to automate that labor. The best way to capitalize on that opportunity is by leveraging CheckAlt's integrated receivables solution. CheckAlt can help your bank determine which current and prospective clients you're working with are a fit for integrated receivables, and how this solution can help your bank attract more clients. Click here to contact us for a demo.